WHY ARE YOU DRAWING A LINE UNDER CLOUDDEAD AFTER SUCH A SHORT TIME? WHY? "Well for a while we weren't even gonna do this album. The idea was there but we're all busy with our other stuff that we didn't think about it until the guy from our label asked us directly to do one." DOSEONE " cLOUDDEAD kind of came out of nowhere so it feels good to let it go back to that. The synergy between the three of us is not like a conventional band and because of that, making these two albums took a lot out of us. We think as one but we work in our own space and that distance is hard to maintain, especially for any collective project." THE LAST ALBUM WAS REGARDED BY SOME TO BE THE "FUTURE OF HIP-HOP. DID THAT PRAISE HAVE A NEGATIVE EFFECT ON YOU? DOSEONE "It put a little pressure on us for sure but ultimately, we look at what we do as being a future of hip-hop rather than 'the' future. Part of the aim when you're sitting in your bedroom slaving over these tracks is to try and create some kind of progression or future - it's not just for yourself. 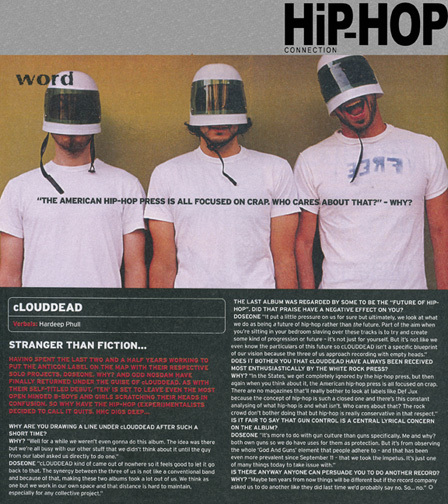 But it's not like we even know the particulars of this future so cLOUDDEAD isn't a specific blueprint of our vision because the three of us approach recording with empty heads." DOES IT BOTHER YOU THAT cLOUDDEAD HAVE ALWAYS BEEN RECEIVED MOST ENTHUSIASTICALLY BY THE WHITE ROCK PRESS? WHY? "In the States, we get completely ignored by the hip-hop press, but then again when you think about it, the American hip-hop press is all focused on crap. There are no magazines that'll really bother to look at labels like Def Jux because the concept of hip-hop is and what isn't. who cares about that? The rock crowd don't bother doing that, but hip-hop is really conservative in that respect." IS IT FAIR TO SAY THAT GUN CONTROL IS A CENTRAL LYRICAL CONCERN ON THE ALBUM? DOSEONE "It's more to do with a gun culture than guns specifically. Me and why? both own guns so we do have uses for them as protection. But it's from observing the whole 'God And Guns' element that people adhere to - and that has been even more prevalent since September 11 - that we took the impetus. It's just one of many things today to take issue with." IS THERE ANYWAY ANYONE CAN PERSUADE YOU TO DO ANOTHER RECORD? WHY? "Maybe ten years from now things will be different but if the record company asked us to do another like they did last time we'd probably say no. So... No.